Born Of A Dream To Create Reality: Looking Back At BEYOND THE BLACK RAINBOW | Birth.Movies.Death. Mandy comes out this week. Get your tickets here! It’s been eight years since Panos Cosmatos unleashed the brilliant, bizarre Beyond the Black Rainbow. Those left wondering what the writer/director would come up with next will get a chance to find out when Cosmatos’ new feature, Mandy, hits theaters this week. So is Mandy an occult horror flick, an action thriller, or something else? A look back at Beyond the Black Rainbow may not answer this question, but it does offer reasons why people are so pumped up about Mandy. It’s a movie which demonstrates Cosmatos’ particular cinematic charm: a refusal to operate within one genre. Beyond the Black Rainbow opens with a title card indicating it’s the year 1983. Next up is a weird informational video of a man introducing himself as Dr. Mercurio Arboria (Scott Hylands). He describes the mission statement of his self-titled New Age commune. He holds a glowing white triangle. 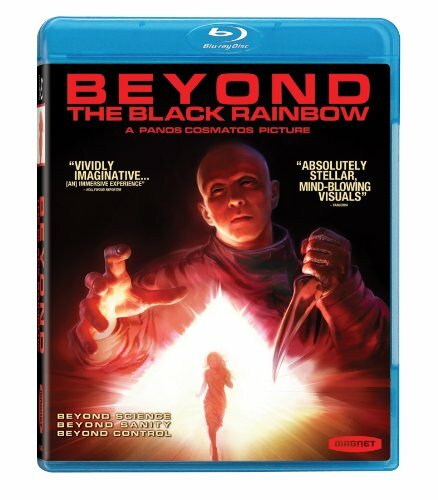 It’s all a bit odd, and at this point Beyond the Black Rainbow could be a retro-futurist science fiction fantasy. After a few opening credits, the screen fills with an intense close up of a human eye then slowly tracks outward to reveal a young woman lying prone on the floor and gazing at something in the distance. This shot recalls the iconic image of Vivien Leigh’s lifeless face post-Psycho shower scene, and makes Beyond the Black Rainbow feel more like a horror movie. Yet, as the scene gradually fades into the image of double exposed glowing triangles, its aesthetic veers closer to experimental art film. For those of you keeping track, that’s three different genres so far, and the movie has only just begun. Beyond the Black Rainbow’s basic plot is more straightforward: Elena (Eva Allan) is a patient at the Arboria Institute under the care of Dr. Barry Nyle (Michael Rogers). She has telekinetic abilities, though she does not speak. Dr. Arboria, who is now much older than he was in that opening video, depends upon Dr. Nyle for his care. While that may read as mundane, Beyond the Black Rainbow is anything but. The film consistently utilizes visual cues to put the viewer into a state of unease, all the while dropping little hints about what’s going on. Extreme close-ups create a sense of disorientation, while repetitive slow tracking shots of overhead lights in a hallway generate claustrophobia. Characters are frequently shown out of focus or not centered within the frame. Beyond the Black Rainbow also employs a vivid color palette, something which almost pushes it into giallo territory, especially when Sinoia Caves’ spooky synth score throbs out of the speakers. However, the modernist set design undercuts this idea, and the tension between such contrasting styles further adds to the suspense. Cosmatos exploits genre tropes to further accentuate the film’s unsettled tone, from Elena looking like a cousin of J Horror’s “Stringy-Haired Ghost Girl" to the antiseptic atmosphere of the Institute itself, a place that is at least as minimalist as the spaceship in 2001: A Space Odyssey. This is why the more ghastly parts of Beyond the Black Rainbow -- Dr. Nyle’s transformation flashback, several supremely fucked up mutant robot people, and a few gnarly kill scenes -- are genuinely horrifying. The viewer can never be quite sure which way the movie will go. Dr. Arborio’s early video introduction promises that the Institute offers a way to achieve “happiness, contentment, and inner peace” with a team of “herbalists, naturalists, and healers” who will help make that dream a reality. In Beyond the Black Rainbow, though, those beautiful dreams have turned into ugly nightmares. When Elena finally escapes, she wanders into a verdant forest that contrasts with the sterile environment of the clinic. Like a puppy mill dog feeling the grass under his paws for the first time, Elena’s joyous reaction to nature is palpable. Ironically, the last scene of Beyond the Black Rainbow shows Elena wandering towards a suburban subdivision with a row of identical houses crammed together, a place that could be interpreted as another kind of prison. The question of whether Elena will find true happiness is left unanswered. Mandy might be a wholly different beast than Beyond the Black Rainbow, but it does continue some of Cosmatos’ particular fixations. It, too, is set in 1983, an important year for the director: it’s when he first began renting movies from a place called Video Addict and became a film junkie. Garish colors play a prominent role in Mandy, as does a central male figure who is both menacing and mysterious. While Beyond the Black Rainbow remains an audacious debut film, Mandy will likely create even more fans for this visionary director. 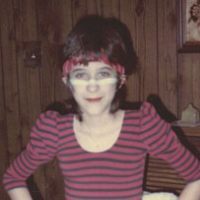 American by birth and Canadian by the grace of Gord, Leslie Hatton has been writing about pop culture since she was 12 years old. She created and ran Popshifter for ten years, but has also contributed to Diabolique, Modern Horrors, Rue Morgue, Vague Visages, and more. She has seen the movie Tuff Turf over 100 times and has no regrets about that fact.